1. Rhododendrons coming out - one of my favourite shrubs to flower are the rhododendrons, who arrive annually in triumphant bursts of colour out by the vegetable garden. The earliest ones we have are in shades of white, light and dark pink and they are such cheery and beautiful flowers! 2. My beauty favourites - I'm loving these two at the moment! The Body Shop Oils of Life came in my April Glossybox - read here - and I'm in love with this second hand but unused Too Faced Sweethearts blush I won on ebay, I swear I'm addicted to that site. 3. Auburn hair - it feels so great to change my look a bit for spring and I love how my hair has a little more shiny 'oomf' to it as well, I adore the rich colour and how it gleams in the sun! 4. 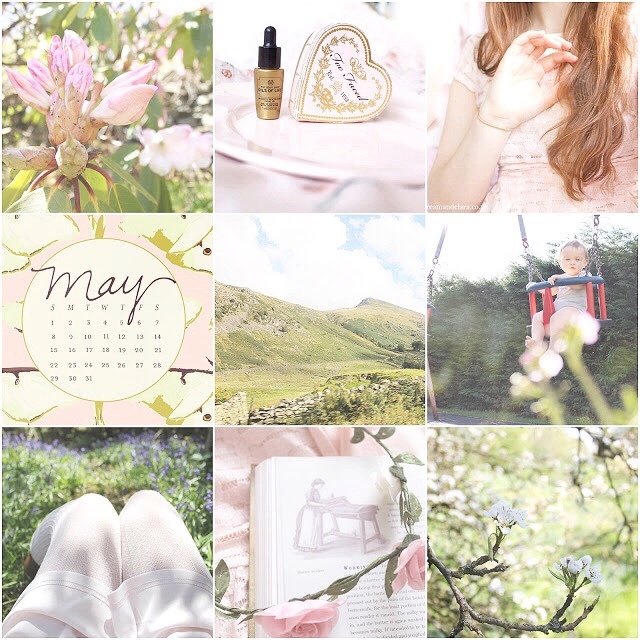 May calendar - this May desktop/phone calendar is gorgeous! It's designed by Bonnie Christine over at Going Home to Roost and she has the most beautiful creations over on her blog. Whenever I fancy changing up my screen, I immediately head over there! 5. Views from the bus - the views from the bus are so lovely this time of year, with the lush green fells and fields coming to life! It really is perfect weather for walking, sailing, paddling and taking a picnic. I definitely plan to spend more time up in the Lakes this summer. 6. Playing in the park - we had some very mixed weather towards the end of April, going from about 20c outside to snowing big fat flakes in the space of a few days! Thankfully it's turned warm again since but this is a little throwback to our warm ventures in the park. 7. Reading old books - I have been learning the old fashioned way to make butter, amongst many other things you find in the kitchen! It's so interesting to know how things were done over a hundred years ago, and to think how much time and dedication went in to each task. 8. Spending time with the bluebells - a little post to follow but I discovered a gorgeous little space in the woods that is completely overrun with bluebells! Between the beck, back of the house and the back of the other wash houses lies a lush carpet of blue, with bees and butterflies flitting to and fro. It's such an ethereal, beautiful place! 9. Apple blossoms - another flower that is out this time of year is the apple blossom. The pearly white flowers are so pretty and dainty and the orchard is overrun with them at the moment. I love these monthly updates, they're great to keep up with what you're doing and your photos are always so nice! Oh I love that May calendar - I'm going to check out that blogger! Beautiful beautiful photos. I always love these posts of yours, they are so lovely and have such gorgeous photos. My favourite season is autumn, although I am loving spring a lot at the moment. Your blog design is SO cute! Such lovely photos too. Elizabeth, these photos are absolutely stunning and makes me very ready spring/summer. The quality of light is beautiful. Loving the mood in all of these pictures, there's nothing better than beautiful, warm and sunny Spring days, it's my favourite season ever! :) And your hair colour looks so lovely! Your IG photos are always so pretty. I want to spend some time in your garden haha!